The cabelas does a good lunch but there is lots better to be had in this area, If you pass Brigham city, MaddOx is a good family steak house, if you go past Morgan lots of people stop at Taggerts, dessert is best. Park city is an amazing place. Your sitter should be a great guide there. If you need trouble assistance send me a pm and I’ll get back. As for me driving for the company, we are in the works of getting a second truck so that I don’t drive my personal truck. As for the excavation company. They have a lawyer involved that day, I think they actually took the truck history, driver history, safety trailing and policy stuff all when they went to the accident. The civil suit idea is simply scary for sure. The drive has always seemed to be sound of mind, good young man from what I have seen. I think the company had a good wake up call a month back when a binder broke on a backhoe bucket and it slid off the trailer. One chain only, on a back road and a police officer watched it I guess. They flipped the truck around and used the hoe to pic the bucket back up and re strapped, replaced all chains and binders on the truck that day. DOT did get involved but mostly as warning type stuff. Helped they company to be prepared for something much worse and low and behold. A tragedy for sure. Deep pockets. I sat through so many cases that crazy things came out of. One where a lady lost an eye in an explosive factory, not following the rules. It was deemed the company's fault via lack of training since jobs were so scarce she had to work there. They were going to pop her eye out in the courtroom, but I addressed that without affecting the case. All wen't to appeal anyway as they broke the set rules all the time in front of the jury. I drug home another salvage camper. This one is pretty bad shape. It has a good roof air conditioner with a heat setting. I want to pull it out and install it in my 5th wheel. One just isn't enough when its 100 degrees out. I am going to have to wire it separately from the rest of the camper so it has its own plug to the pole. Winter project. I am going to cut the axles out and put them on my smoker/BBQ I built a year or so ago. I used a single axle with no suspension. The tongue is so heavy I cant pick it up and it bounces allover the road. 2 axle with springs will be much better. l moved some stuff from the main house to the hide. Starting to try to fill it up but my shelving is still sitting in Arlington Texas and won't be here until thursday at the earliest. Charles, I don't think "The Hide" is the proper name anymore. The weekend resort would be more fitting. Maybe you meant mai tai? Let’s not get hung up on the small details Charles! Ken knew what I meant & he’s probably already packed and on his way. For your sake let’s just hope he doesn’t bring H.
Lol. Did I mention the backhoe and bag of lime?? That is sweet, will have to remember that when mine get there. My boys troop average about double the national for earning Eagle. I woke at 5am to the police knocking at our door. Had been awake, saw I had two missed calls around 3am. With business ringing to my phone I set the iPhone so that I don’t receive calls from 11-6 unless someone calls me twice within 3 minutes. Two different numbers I did not recognize at about 15 mins apart. Both hippyland numbers, which I found odd. So then the knock, ringing of door bell & me half awake / pissed telling them to give me a minute. Get door open, two cops usual staggered formation. The one off the side starts by saying there was some arguemrbt between some girls last night. At this point I know I have the wtf look on my face. Then he mentions my youngest daughters friend’s name and states she’s missing & didn’t come home. Long story short my wife had picked my daughter up at a friends house last night after youth group. Our daughter wasn’t allowed to stay the night. This other girl spent the night and never told her mom or asked I gather. Then said Mom goes to sleep without knowing her kid is home. Trouble is, a lot of people don't do standard parenting. It is why the country is where it is. I am a big supporter of the gps on my kids. It keeps them honest and gives parents peace of mind. Other coworkers tell me it’s an invasion of privacy my typical response is they don’t get privacy until the first pay for the phone or turn 18 and no longer live off my dollar. Until then I get to know all!! According to my youngest she wasn’t part of argument. I recognized one of the officers, he lifts in morning at same gym as I. Guessing after his shift which makes sense on a couple angles as I always thought he carried himself like a police officer too! I agree Dave. Just had to get daughters iphone fixed, again! I tried family map but it no good (1/4 off), what are you using? Shawn still not tracking. No pun intended. Why did they come to your house? Did they find your daughters friend? Helicopter Mother it would appear thought her daughter was at my house. My wife had picked the three girls (3 girls 3 different parents) up from local mall where they had been shopping for school clothes. When my wife picked them up the original plan was to take the other two girls home. However, the girls wanted to go to a youth group event so my wife dropped all three off at the girls house where this girl who has the helicopter parent stayed the night. My daughter was dropped off around 8pm last night by the parent who hosted the sleepover. So apparently the daughter and helicopter mother had not communicated since 6pm or prior it would appear. Which is why helicopter mom & police arrived at my house at 5am and had been calling since before 4am. Can’t make this up, it’s unfortunate. Helicopter mom is single working professional, according to my wife has some severe digestion related health issues. So reading between the lines I think some prescription meds may have been involved, thinking why she fell asleep early. Just an educated guess on that part in hindsight. Update is that daughter is being made to write everyone involved an apology letter including PD officers & has life360 on her phone now. Celebrated my youngest’s first birthday. Then drive to Grand Rapids for work. Heading home on Thursday. The boy is incapable of figuring out how to mow the lawn, the boy just doesn’t get it. He was making zig zags in the lawn after I showed him what I wanted, instead of Turning into uncut grass he turns away from it and pulls the mower backwards. Becides work we sliced and bagged 20 lbs of bacon that I smoked Sunday. Also sold the salvage camper I dragged home the other day. Was going to scrap it but decided to throw it on on Facebook marketplace. Easiest $500 I ever made. Got the toilet plumbed on the upstairs bathroom. A little tight and above a cabinet over a sink. We have a cool event happening at work today. It is Wind Appreciation week. For Power that is. Not Wyoming style. We have a 59 meter long blade in our parking lot for visitor to view as well as the Schnabel tower trailer hooked up to the truck with the big sign. This is the last week the summer intern in the group I am in at work is here. Talking to him earlier this summer he mentioned he had shot his grandpa's pistol once a few years back but that was his only firearms experience, had never even held a rifle. So I offered to take him to the range sometime. I had him start out at 50 yards shooting a .22LR. Then a bolt action .223 hunting rifle, followed by an AR15 chambered in .223. Then I think a few rounds through my uncles .30-30 lever action rifle, with the horrible buck horn open sites. He was surprised he was able to hit the paper with that one. Then a handful of shots through my custom 6.5 CM precision rifle. Then a few rounds through my Remington 7600 hunting rifle in .270. Finished up with a few shots through my 12 gauge shotgun I have setup for home defense. It was a fun night of shooting. He definitely appreciated the experience and learning. He said he was surprised at how difficult it was to make accurate shots. You can't just point and squeeze and have the bullet go exactly where you want it in the same hole every time. He asked a lot of questions about gun regulations, what is needed to buy a gun and how to find some place to shoot. Driving back he told me how one time his parents and uncles had gotten all upset at his grandpa for having guns in his house when the grandkids were over playing. I suspect that he has always been told guns were evil or some other misrepresentation. I think that if he gets back to school and can find a place to shoot he might consider purchasing some type of firearm himself. Man, that blade is all bent up! What kind of quality manufacturin' is that? Think they could have gotten the thing a bit straighter! 59 metres? WTH!! ...Didn't know they made them that huge here in the states. Sounds like a blast Bear. He will remember that day the rest of his life. Good job Bear! One mind at a time. Sounds like you all had a heck of a good day. 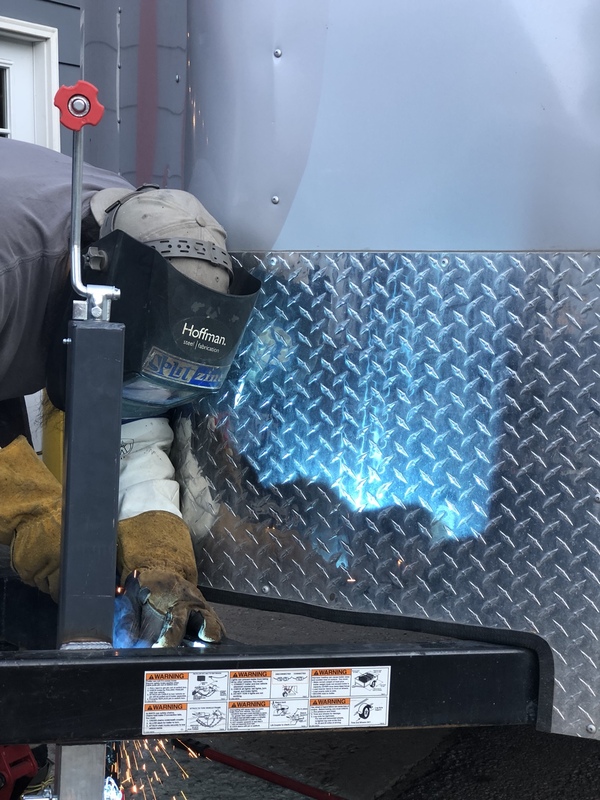 I woke up early to have a new trailer jack welded onto my job trailer. Old one was best to hell. Dave, is this the guy with the cool home made shop press? So, been awol for awhile, to the point Don feared that I'd fallen pray to the strict gun control measures that keep Chicago safe over the past weekend. Truth be told, I've been practicing for retirement! Chased dogs around So. Missouri for 25 days staying in the camper, payed off the Dmax, bought the wife a new to us Acura MDX with me keeping the old one, actually had a horse go full blown rodeo on me without warning to the point that I chose to get off before playing superman, and best of all, met my grandson Toan for the first time! His mother (my oldest) and husband live in Detroit......go figure, I was safer in DETROIT than Chicago!? Tomorrow, is my LAST first day of school marking the end of summer until next year when I get to live the dream of Endless Summer......wasn't that a Beach Boys song/album? Very cool about the grandson. Fine looking young man. Finally sent a few rounds through my suppressor between rain showers. I enjoyed the heck out of it and am really looking forward a 300blk sbr now. After that I had bagpipe lessons. Our department is starting a pipes and drums band and I volunteered to wear a kilt. Learning to play the bagpipes is just a bonus. How do you pronounce that name of your grand son? I have a friend named Roan, Row-N. Is it Toa-N or tone? What is with the weird left turn lanes?? Wife had us go by the “Up” house out in Riverton/Herriman first and came across these a few times. These things are supper comical to watch big trucks go through.